The Aptitude Area online Mock Test is Very helpful for all students. Now Scroll down below n click on “Start Quiz” or “Start Test” and Test yourself. Perimeter = Distance covered in 8 min. = (12000/60 × 8) m = 1600 m.
Let length = 3x metres and breadth = 2x metres. Then, 2(3x + 2x) = 1600 or x = 160. ∴ Length = 480 m and Breadth = 320 m.
∴ Area = (480 × 320) m2 = 153600 m2. 100 cm is read as 102 cm. ∴ A1 = (100 x 100) cm2 and A2 (102 x 102) cm2. The ratio between the perimeter and the breadth of a rectangle is 5 : 1. If the area of the rectangle is 216 sq. cm, what is the length of the rectangle? A rectangular park 60 m long and 40 m wide has two concrete crossroads running in the middle of the park and rest of the park has been used as a lawn. If the area of the lawn is 2109 sq. m, then what is the width of the road? Area of the park = (60 x 40) m2 = 2400 m2. Area of the lawn = 2109 m2. ∴ Area of the crossroads = (2400 – 2109) m2 = 291 m2. The diagonal of the floor of a rectangular closet is 7.5 feet. The shorter side of the closet is 4.5 feet. 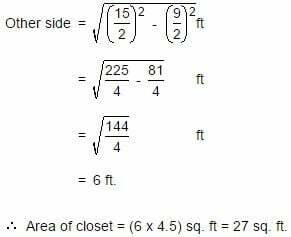 What is the area of the closet in square feet? What is the least number of squares tiles required to pave the floor of a room 15 m 17 cm long and 9 m 2 cm broad? Length of largest tile = H.C.F. of 1517 cm and 902 cm = 41 cm. Area of each tile = (41 × 41) cm2. Required number of tiles = (1517 × 902/41 × 41) = 814. We have: (l – b) = 23 and 2(l + b) = 206 or (l + b) = 103. Solving the two equations, we get: l = 63 and b = 40. ∴ Area = (l x b) = (63 x 40) m2 = 2520 m2. The length of a rectangle is halved, while its breadth is tripled. What is the percentage change in area? 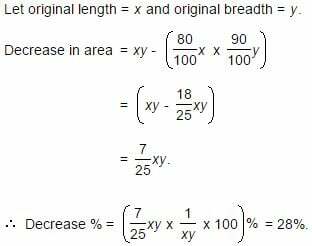 Let original length = x and original breadth = y. New length = x/2 . New area = (x/2 × 3y) = 3/2 xy. ∴ Increase % = (1/2 xy × 1/xy × 100) % = 50%. The length of a rectangular plot is 20 metres more than its breadth. If the cost of fencing the plot @ 26.50 per metre is Rs. 5300, what is the length of the plot in metres? Let breadth = x metres. Then, length = (x + 20) metres. Perimeter = (5300/26.50) m = 200 m.
Hence, length = x + 20 = 60 m.
A rectangular field is to be fenced on three sides leaving a side of 20 feet uncovered. If the area of the field is 680 sq. feet, how many feet of fencing will be required? We have: l = 20 ft and lb = 680 sq. ft. So, b = 34 ft.
∴ Length of fencing = (l + 2b) = (20 + 68) ft = 88 ft.
∴ Cost of plastering = Rs. (744 × 75/100) = Rs. 558. Each of the questions given below consists of a question followed by three statements. You have to study the question and the statements and decide which of the statement(s) is/are necessary to answer the question. What is the area of the hall? III. Total cost of flooring the hall is Rs. 14,500. II. Labour cost = Rs. 3500. III. Total cost = Rs. 14,500. Let the area be A sq. metres. ∴ Material cost = Rs. (14500 – 3500) = Rs. 11,000. ∴ 5A/2 = 11000 ⇔ A = 11000 × 2/5 = 4400 m2. Thus, all I, II and III are needed to get the answer. ∴ Correct answer is (C). What is the area of a right-angled triangle? I. The perimeter of the triangle is 30 cm. II. The ratio between the base and the height of the triangle is 5 : 12. III. The area of the triangle is equal to the area of a rectangle of length 10 cm. From II, base : height = 5 : 12. Let base = 5x and height = 12x. Then, hypotenuse = √(5x)2 + (12x)2 = 13x. From I, perimeter of the triangle = 30 cm. ∴ 5x + 12x + 13x = 30 ⇔ x = 1. So, base = 5x = 5 cm, height = 12x = 12 cm. ∴ Area = (1/2 x 5 x 12)cm2 = 30 cm2. Thus, I and II together give the answer. Clearly III is redundant, since the breadth of the rectangle is not given. ∴ Correct answer is (A). 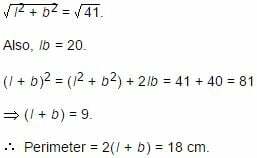 What is the area of rectangular field? I. The perimeter of the field is 110 metres. II. The length is 5 metres more than the width. III. The ratio between length and width is 6 : 5 respectively. I. 2(l + b) = 110 ⇒ l + b = 55. II. l = (b + 5) ⇒ l – b = 5. III. l/b = 6/5 ⇒ 5l – 6b = 0. These are three equations in l and b. We may solve them pairwise. ∴ Any two of the three will give the answer. ∴ Correct answer is (B). Each of these questions is followed by three statements. You have to study the question and all the three statements given to decide whether any information provided in the statement(s) is redundant and can be dispensed with while answering the given question. What is the area of the given rectangle? I. Perimeter of the rectangle is 60 cm. II. Breadth of the rectangle is 12 cm. III. Sum of two adjacent sides is 30 cm. 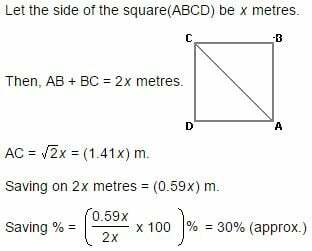 From I and II, we can find the length and breadth of the rectangle and therefore the area can be obtained. 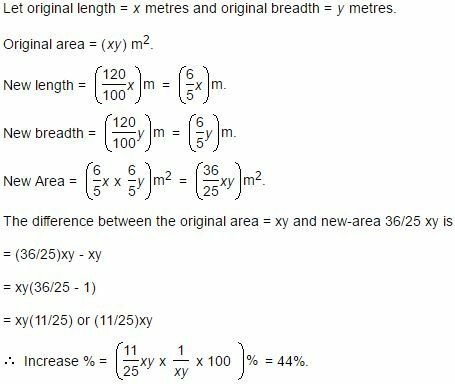 Also, from II and III, we can find the length and breadth and therefore the area can be obtained. ∴ Correct answer is “II and either I or III”. What is the cost painting the two adjacent walls of a hall at Rs. 5 per m2 which has no windows or doors? I. The area of the hall is 24 sq. m.
II. The breadth, length and height of the hall are in the ratio of 4 : 6 : 5 respectively. III. Area of one wall is 30 sq. m.
All I, II and III are required. From II, let l = 4x, b = 6x and h = 5x. Then, area of the hall = (24x2) m2. From I. Area of the hall = 24 m2. From II and I, we get 24x2 = 24 ⇔ x = 1. ∴ l = 4 m, b = 6 and h = 5 m.
Thus, area of two adjacent walls = [(l x h) + (b x h)] m2 can be found out and so the cost of painting two adjacent walls may be found out.